Ironweed is a common name often given to a many different weeds, however it is most correctly given to those members of the Vernonia genus. 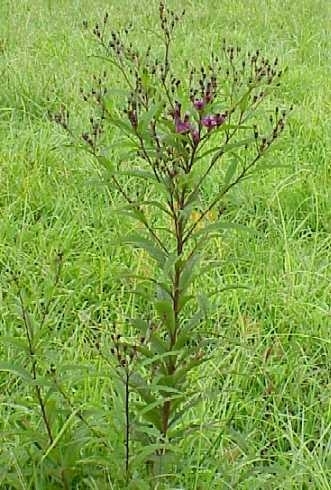 The ironweeds are perennials with showy purple flowers. 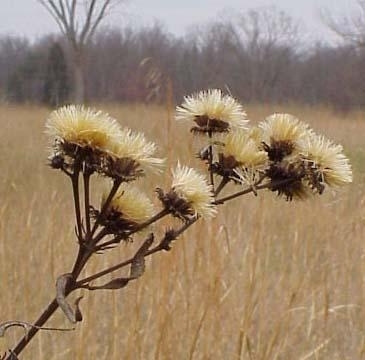 They were given the name ironweeds because of their stout stems that often persist throughout the winter. 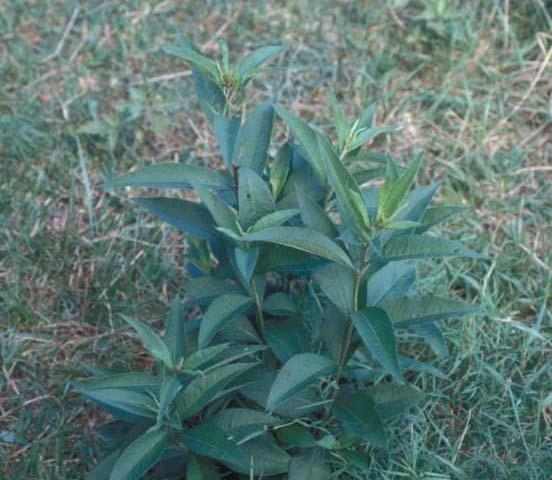 The ironweeds are primarily weeds of pastures, hay fields, and roadsides and are distributed throughout most of the southeastern United States. All leaves occur along the erect stem unlike some ironweeds which have many basal leaves and smaller stem leaves. The leaves are elliptic to lanceolate in outline, ranging from 4 to 10 inches in length and 3/4 to 1 1/2 inches in width. Leaves are usually without hairs on the upper surface and may have many soft white hairs beneath. Many small teeth occur along the leaf margins. 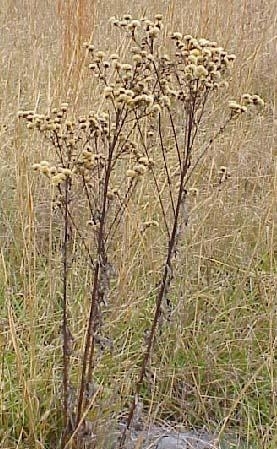 Erect, ranging from 2 to 7 feet in height. Several stems can arise from a single crown. Stems usually persist through the winter. Occur in clusters at the ends of the erect flowering stems. Flowers are purple in color, approximately 8 to 12 mm long. Each flower occurs on a flower stalk (peduncle). A perennial basal crown from which plants can arise year after year. 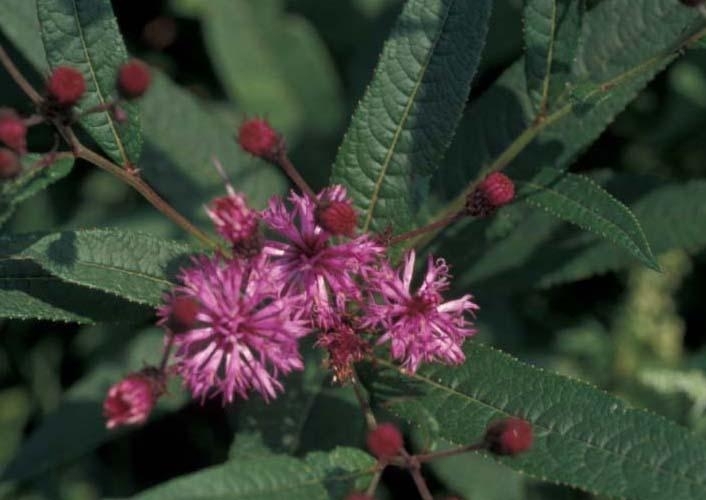 The elliptic to lanceolate leaves with minutely toothed margins, the clusters of purple flowers, and the stems that persist throughout the winter are all characteristics that help in the identification of New York ironweed. 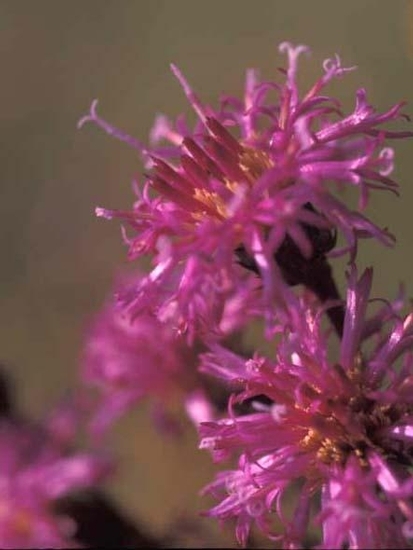 Several other related ironweed species may be found in similar habitats, and these are primarily distinguished by the presence or absence of basal leaves, the width of the stem leaves, and the presence or absence of toothed leaf margins. 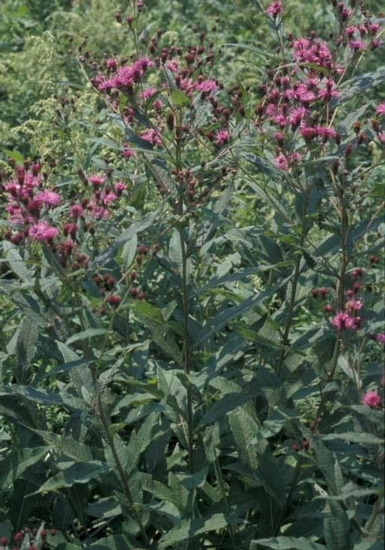 New York ironweed is sometimes confused with Stickweed (Verbesina occidentalis) or Wingstem (Verbesina alternifolia), however both of these weeds have yellow flowers and several wings of tissue that run the entire length of the stem.